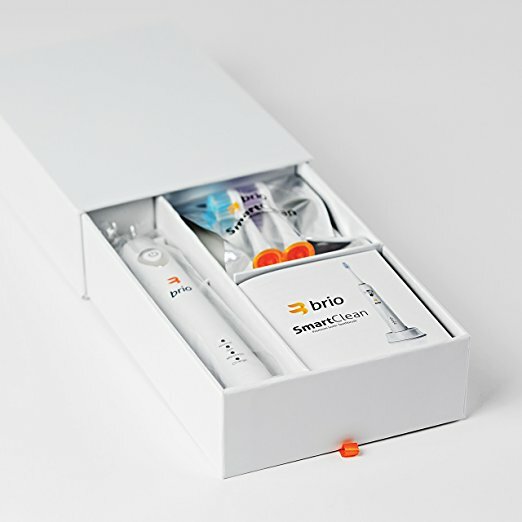 Brio is here to prove that Philips is not the only brand that manufactures sonic toothbrushes. And, we are here to tell you, that Brio has come up with a very respectable and competitive sonic toothbrush. The SmartClean model is designed to clean your teeth and gums in a way that no manual brush can compare. With over 31,000 strokes per minute, it can certainly help to make your mouth feel clean and fresh. The vibrations created by this brush, make Micro-bubbles, these don’t just use the bristles but they also use the fluid within your mouth to give an overall great clean. The brush is very effective at cleaning your gums and in-between your teeth, to keep your mouth fresh and prevent bad breath. The bristles on the brush head are strong enough to give a deep clean on your mouth, but are soft when it comes to cleaning your gums, helping to prevent any damage to them. Easy to use, has a great grip feel, meaning you can put pressure on without accidental slips. The sonic technology within the brush gives a deep and consistent clean. Comes with 2 brush heads as standard, unlike other brushes. Up to 3 weeks of battery life. 2 years manufacturer warranty, this helps to give confidence when purchasing as the manufacturer will replace the device for 2 years should any problems occur. The battery is larger than those found in other toothbrushes, making the overall weight of the brush heavier. No travel case included in the box unlike its rivals. More of an intense feel, when compared with other electric toothbrushes on the market. The Brio Smartclean Sonic toothbrush gives your mouth a much fresher smell, giving a better clean than can ever be expected from a manual brush. The vibration it uses is great for massaging the gums without causing any damage or pain. As many other electric toothbrushes, the Brio Smartclean pauses the brush vibrations at 30 seconds intervals, indicating for you to move the brush to a different section of your mouth. This helps to give you an even clean overall for the recommended 2 minute brushing time suggested by dentists. The main reason to purchase an electric toothbrush is its ability to remove a lot of plaque and bacteria built up in your mouth throughout the day and night. It can also reach those hard to reach places a manual brush would struggle with, removing bacteria from underneath braces, around the gum line and between your teeth. The pressure which this brush applies is strong enough to remove even the hardest of plaque and tartar which has built up in those hard to reach areas. This, of course, helps to remove bad breath and keep your mouth fresher for longer, encouraging you to show off your smile more often. Optimal sonic technology which is used within this brush helps to give it 31,000 brush head movements per minute. This gives a better clean than you would ever be able to achieve when using a manual brush. There is a powerful motor which has been fitted inside this unit. It helps to give a more controllable brushing than you would be able to get when using a manual toothbrush. Having this power motored brush is better will inevitably prolong the life span of your teeth. The pressure sensor will prevent over-brushing and give your gums a gentle massage. Often times, brushing too hard with a manual brush can cause your teeth to weaken over time. With a large battery capacity, this brush is able to last up to 6 weeks of usage. There is a 2 year warranty which comes with every brush sold, not only this but there is also a brush head replacement service, which will allow you to get low cost brush head replacements. The brush has 3 usable settings. These come alongside a 2 minute timer, which will help you to achieve the correct amount of brushing time, allowing you to have a good clean overall. This model also has the QuadPacer feature, which allows you to better time how much time you spend per zone of teeth. 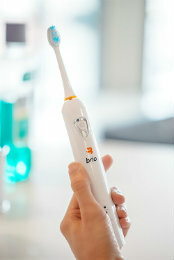 The Brio Sonic toothbrush is ideal to use daily and can help you to be consistent when brushing. This will help prevent cavities, tooth decay, bad breath and plaque build-up. When it came to testing this brush, we found that the battery really did most definitely not stand up to the quote 6 week usage time from a full charge. At best, we were able to get it to work for 21 days, without changing setting too much. We are yet to see an electric toothbrush that can last 6 weeks on one full charge. As a matter of fact, we are yet to see one that can last even 4 weeks. The 3 different brushing modes made for a good clean all round. and with the pause of vibrations at 30 second intervals, we were able to get a consistent clean throughout. After using the product for a month we saw significant improvement in our teeth and had fresher breath which lasted longer than when using a manual toothbrush. 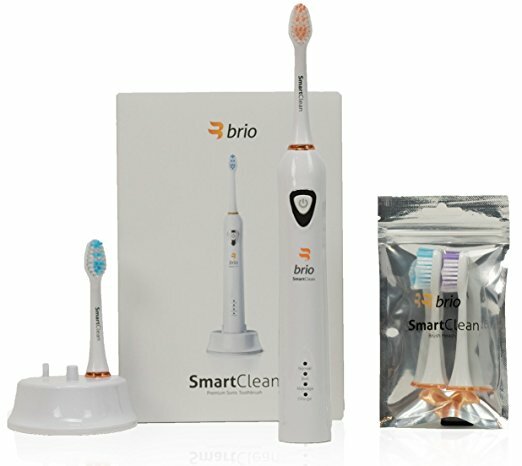 Overall, the Brio Smartclean Sonic is a great toothbrush and we would recommend it over using a manual brush. Furthermore, this gem is half the price of what you would pay for a Philips toothbrush with the same features.